Email us directly or simply phone Lowestoft 01502 574669 or Leiston 01728 830414 or call in to either of our booking offices and we will take care of the rest. You can make your payment either by cash, cheque, bank transfer, debit or credit card. Don't forget you can now also book and pay balances online. All tour prices are based on 2 persons sharing a twin or double bedded room. Single rooms are always in short supply and there is usually a supplement to pay, which is detailed on each individual tour. All special requirements (eg. low floors, bath rather than shower etc.) will be passed on to the hotel but we cannot guarantee that it will be possible to comply in every case. 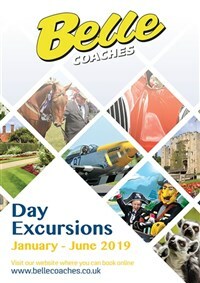 Your coach seats will be allocated at the time of booking. Some of the coaches have slightly different seating configurations but once booked, you seat number will not be changed without your prior consent. We politely ask that you keep to one small medium sized suitcase per person, each weighing no more than 18KG ((40lb), and measuring no more than 70 x 30 x 45 cm. A small bag may also be taken on board the coach. On overnight hotel stops, all luggage must be removed from the coach for security reasons. 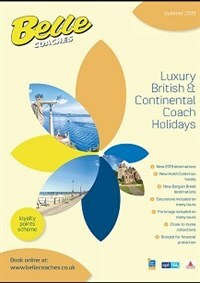 Here at Belle Coaches we are always looking for ways to ensure that you choose the right holiday for you. Therefore please give special consideration when choosing your holiday and if in doubt of any aspect of the excursion programme, please ask one of our experienced staff for more details. We are only able to carry mobility scooters that come under the "car transportable" type. Due to health & safety regulations, these must not exceed 40KG in total and you must be able to dismantle the scooter yourself and have it readily dismantled at the roadside for your collection on the day of departure. Please note: Due to the size of the coach, we are limited to how many we can carry on each tour, however there is always the option to hire a scooter on tour! If you live in the following postcode areas we will arrange to collect you from as close to your home as possible and drop you off at the end of the tour. NR1-7, NR13-15, NR29-35, IP1-5, IP12-13, IP15-20. (Please note, due to the nature of some of our vehicles, it may not be possible to pick you up from your address. We will inform you near the time of departure of any necessary changes to your pick up point). The exact arrangements and pick up time will be confirmed 5 to 7 days before departure. If you live outside these areas, call us and we will do everything we can to arange a pick-up point that is convenient to you. A supplement will be quoted if a taxi is required. Alternatively you can be picked up from our Hadenham Road depot where your car can be securely parked for the duration of your tour. 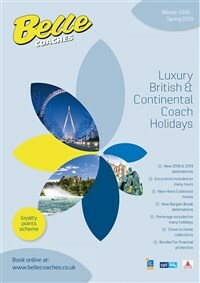 On selected tours we do offer Travel Only. Depending on the availability of the tour this may not always be possible. Very occasionally it may be necessary to use a coach with a different seating configuration or without an onboard WC but frequent stops will be made.